But isn’t there a danger in encouraging children to read or watch films that portray a Polynesian creation myths or promote fantasy? C.S. Lewis, who wrote the Narnia stories, had this advice. In previous Carol Services, our understanding of the Christmas message has surely been enriched by taking C.S. Lewis’ advice. So this Christmas, what does Moana have to say that sheds light on the Christmas message? Clearly no children’s fantasy, least of all a Disney animation, can come close to the original, historical, factual eye-witness accounts we have read from the Bible this evening. 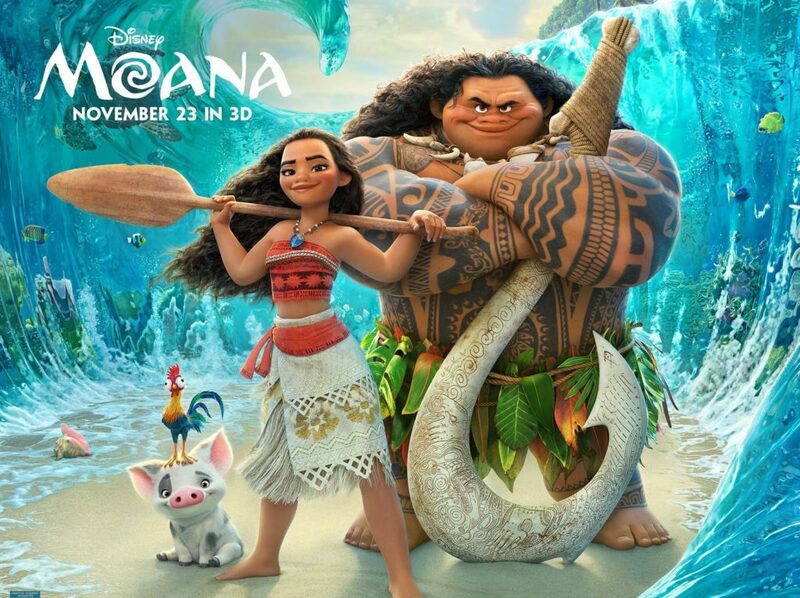 Although set within Polynesian culture, with catchy tunes and stunning animations, Moana nevertheless has much to teach about self-discovery, trust, courage, perseverance, responsibility and sacrifice. It also has something to say about team work, harmony, confronting evil and creation care. This world is bursting with life, abundant, bountiful. Both Joseph and Mary, her cousin Elizabeth and Zechariah, the Shepherds and the Magi were all prompted by the Holy Spirit, by dreams or by angels, to respond to God’s calling. Jesus promised that the Holy Spirit will guides us too, to fulfil our destiny. What better time to listen for God’s whisper in our soul, than when we remember how God spoke to Mary and Joseph, the shepherds and the Magi calling them to fulfil their part in his great redemptive plan for the world. God loves you and created you to know and serve him. In Moana we encounter Polynesian culture and religion. We are told for example “in the beginning, there was only ocean” and that a goddess created all life. The male hero, Maui, is a demigod – a cross between a person and a god. There are mild references to polytheism (the belief in many gods) and animism (the belief that objects and animals can have spirit qualities). Moana’s grandmother is reincarnated and tells her “the ocean chose you”. The ocean is portrayed as alive and personified. Moana has more fun with the ocean but I’ll leave you to discover what. But don’t be put off not least by the scariest character in the movie, the Demon of Earth and Fire. The Bible insists evil is real –personified in Satan and no one is immune from his influence. Because people are separated from God, they are like orphans, living in darkness, they are confused in their thinking and have lost a sense of who they are. It should therefore not be surprising that worship of man-made gods is universal. Moana also reminds us that the Fall has impacted not just human relationships but the whole of creation as well. The trigger moment for Moana’s story is when the fishermen return with empty nets, and the coconut harvest fails. God loves you and created you to know and serve him. But we are separated from God because of sin. This has tainted all human relationships, impacted creation and led to many false religions. That is why we need a Saviour. Jesus came to bring light where there is darkness, Forgiveness where there is guilt, glory where there was shame, peace where there is conflict, joy where there is sadness, freedom where there is slavery and eternal life where there is death. And that light, that forgiveness, that peace, that joy, that freedom and that life is for everyone on earth. The child in me identifies with Moana as she follows her heart. And the Christian in me identifies with Moana too as she leaves the comfort and safety of her island, to obey a higher call to save her people. A strong role model, Moana demonstrates courage and selflessness. Not only that, she inspires her fellow islanders to rediscover their destiny too, to be voyagers and search for new islands to inhabit. If we have truly seen his glory, like the angels, like the shepherds and the Magi, how can we not long to share him, long for others to see his glory too? The call of God has always been to leave our island to reach the nations. In the New Year on Sunday mornings from January to Easter we will be rediscovering what it means to be on a pilgrimage with Jesus. But for tonight, we are reminded that the Christmas message is this: God loves you and created you to know him. But we are separated from God because of sin and death. That is why God sent his Son, the Lord Jesus Christ to save us. But we must receive him, obey him and follow Him if we are to fulfil our destiny. The beauty, wonder and the glory of Christmas is this, “Our God came in human flesh… His Spirit calls us into the ocean of abandonment for the sake of the gospel. So let’s step out in faith” this Christmas.